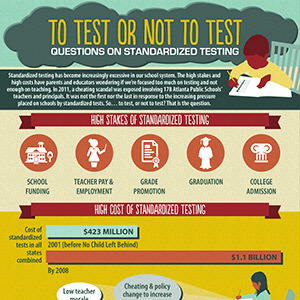 Since No Child Left Behind in 2001, standardized testing has become increasingly excessive in our school system. The high stakes and high costs have parents and educators wondering if we’re focused too much on testing and not enough on teaching. In 2011, a cheating scandal was exposed involving 178 Atlanta Public Schools’ teachers and principals. While admittedly one of the largest, it was not the first nor the last in response to the increasing pressure placed on schools by standardized tests. So… to test, or not to test? That is the question. 1845: First reported use of a written examination was administered by policymakers in Boston public schools and the surrounding areas for comparison. Policymakers used the low test scores to shame and fire educators. 1938: Kaplan Inc. was founded as a tutoring service for tests. At the time, the SAT was unfairly used to exclude Jewish applicants from some colleges. Stanley Kaplan, son of Jewish immigrants, cracked the code on the SAT and coached his students on the ideology behind the test, giving them a better chance at a higher education. 1967: Hobson v. Hansen was filed on behalf of a group of Black students in Washington, DC. The court ruled that the policy of using tests to assign students to tracks was racially biased because the tests were standardized to a White, middle class group. 2001: President George W. Bush signed the No Child Left Behind Act into law. This tied federal funding of schools to standardized test performance and annual academic progress. April 2014: Hundreds of principals, teachers, parents, and students protested the state standardized tests on the streets of New York City. May 2014: A group of teachers filed a law suit against the Houston Independent School District over a policy tying pay and employment to standardized test results. Founded in 1926, the SAT is a measure of college readiness that serves as one of the leading considerations for a student’s admission to college. As nation-wide SAT scores continue to decline, research calls into question the efficacy of high-stakes testing. *In these years the SAT was on a 1600 point scale. We scaled them up to the current 2400 point scale for comparison. Research shows that the SAT might unfairly put minority students at a disadvantage. If the question results change the SAT bell curve, the question is discarded. If the question maintains the SAT bell curve, it is included in the next year’s test. The SAT has had the same bell curve since 1926 [example of the bell curve here: http://www.testmasters.net/satabout/scoring-scale]. Since over 50% of SAT takers are White [see chart below], this methodology ensures that each year’s tests will have even more questions that Whites answer better. In 2012, an analysis of 2 years worth of experimental questions revealed that none of the 156 questions that were included in the SATs were questions in which Blacks answered better than Whites — even though Blacks did answer better than Whites on many experimental questions. When Whites didn’t perform well on these questions, they had a greater effect on the bell curve, and the questions were therefore discarded. very few questions that are neutral (all demographics answer it consistently good or bad). many questions that are biased (different demographics answer it differently). Over 800 four-year colleges and universities have instituted “test score optional” policies in response to the research on standardized tests. Non-submitters earned GPAs only 0.05 lower than submitters. Non-submitters have graduation rates only 0.6% lower than submitters. Currently, 571 organizations and 18,955 individuals have signed a National Resolution on High-Stakes Testing. They are calling on policymakers to reduce testing mandates and reexamine public school accountability in order to improve the quality of learning in the classroom and reduce the negative effects on students, teachers, and campuses. It’s time to take a time out from high-stakes testing!